Modern ERPs are playing vital in role customer engagement. They hold vital data points that help companies craft personalized experiences. These new grade of ERPs work hand in hand with other systems in the eco-system like accounting systems, CRM, business intelligence, etc., to achieve this. Microsoft’s Dynamics 365 is specifically built for this role. Over the past few years, companies have successfully leveraged on Dynamics 365 to achieve rapid growth. By taking to the cloud, Microsoft has created a true enterprise-grade ERP capable of the above functions. Dynamics 365 has the capability to create world-class experiences for e-commerce players. However, to achieve this, e-commerce owners need equally strong integration platform for bringing Magento and Dynamics 365 together. 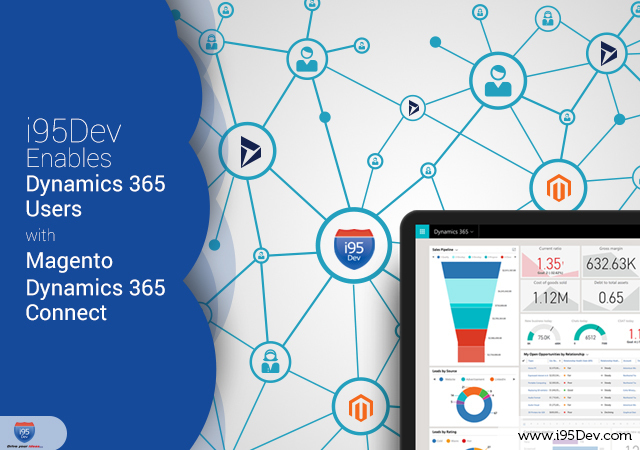 i95Dev’s Magento Dynamics 365 Connect is a comprehensive and flexible solution that helps e-commerce players build a unified ecosystem. Most online store owners have specific requirements pertaining to their e-commerce needs and workflows. The breadth of systems can also drastically vary, all of which can be handled by our connector. The implementation of the connector is designed to match the requirements of the online store owners. Rather than taking a standard product approach, we take a consultative approach by initiating a dialog with the customer to understand the requirements. The solution provided will be an all-around one rather than a specific solution. Over the past decade of helping e-commerce store owners, we realized one solution does not suit everyone. Hence, our product is designed for rapid customization to suit the custom workflows of the customers. Accordingly, our engagement is designed to discover these pockets of customization to adapt to our customer’s needs. Discovery – Our connector comes with a standard set of features. However, this might not be suitable for every organization. The discovery process will help us arrive at the solutions suitable for the customer. Customization – The outcome of the discovery process is to recognize customizations necessary for the operations. Our connector is built to adapt to the custom requirements of any e-commerce store operations. Free Support – Every connector purchase comes with specific hours of free support from our technical and customer support team. This will address any onboarding challenges the users face during the initial phases of adoption. While our new methodology helps customers customize, the features supported are vital. Our connector supports all the basic features that are necessary for smooth operation. Customers – Customer information is vital for any e-commerce store. Depending on the workflow, customer information can flow from ERP to Magento or vice versa. However, the state of the data must be maintained with a clear hierarchy for efficient operations. Products – In most cases, ERP (Dynamics 365, in this case) generally is where the product information is updated. However, in some cases, Magento can also act as the master of the information. Either way, product information is a critical piece of data to be updated. Pricing – Pricing is one of the most complicated features in any e-commerce ERP integration scenario. Most e-commerce storeowners leverage on flexible pricing to woo customers. The workflows in this can be a very complex and the integration platform must adapt to these requirements. Orders – Order information generally originates from Magento via a web store, mobile app or a marketplace. Workflow for each e-commerce store can be quite different and complex. Additional, features like order edits and backorders can further complicate the workflow. Payments – Payment management is a very diverse feature. The workflow can drastically change from one industry to another or one country to another. In some cases, the payment and reconciliation workflow can be very complex and the integration platform must be able to adapt accordingly. Inventory – Inventory information is vital for avoiding underselling and overselling. Accurate information management depends on various platforms including the integration platform. Shipping – Shipping information management drastically differs from one industry to another. Complicated shipping management platforms like ShipperHQ and Temando must work in tandem with ERP and e-commerce platform to handle the requirements. I95Dev’s Magento Dynamics 365 Connect can handle all the above features while accommodating a broad range of custom workflows. Most growing e-commerce players might not realize the benefits of such a comprehensive solution. However, the requirements and the features discussed here are bound to make sense to them during their growth spurt. Our solution provides an opportunity for small and medium e-commerce players to grow without hindrances. Today, most industry players (read giants) are hyper-focused on aspects like omnichannel experience. However, for a smaller player to compete with the likes of Amazon and Walmart, they need tools to build a similar experience in their stores. While Magento and Dynamics 365 are great platforms to leverage on, the two systems working in silos cannot amount to much efficiency. We can help you bring them together in a sensible manner. Contact us to know more.